If you need a break from the beach (yes, poor you!) and are up-to-date on shows from your last Netflix binge, then there’s really only one solution. Yep, that’s right, we’re feeling inspired from re-runs of Russell Coight’s All Aussie Adventures and we’re making time to hit the road a reality. So, get kitted up in your activewear and shock your system by actually using your Lululemons for their intended purpose. 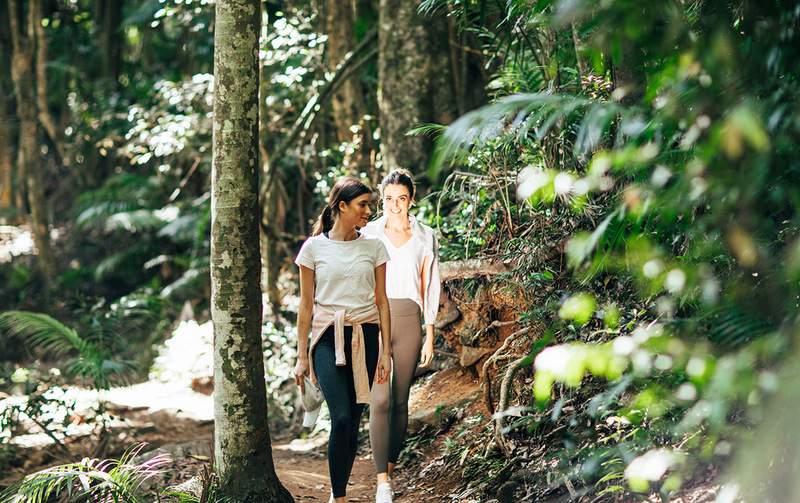 We’ve broken down the best bush walks on the Gold Coast, from a quick stroll to a full day in the wilderness, that’ll even make Tarzan jealous. Roughly an hour’s drive away from the glitter of the Gold Coast is where you’ll find yourself on a windy road incline with views that’ll take your breath away. With a drive equally as entertaining as the various walks, it’s the perfect remedy for a day off the grid. Do one better, take the kids and explore the treetop walk for some family fun. The must-do walk for any local. If you’re eager enough, wake up when it’s dark and be the first in Australia to witness the sunrise. Once you’ve mentally prepared yourself for the incline, you’ll be faced with a steep rock climb to reach the final viewing point. With views from Byron Bay to Gold Coast, we assure you the challenge is worth the reward. Combining the tranquillity of rainforest streams and canopies? Yes, please! For a little day activity, take an easy stroll with your mates and awe at the beauty of the naturally formed bridge, while the birds sing to you like you’re Snow White. If you’re looking for something extra cool, head here after dark to take in the glow-worms. With a suspension bridge for optimum views, you’ll walk through eucalypt forests before descending into the gorge for a view from below. With a steady descent and climb involved (best travelled in a clockwise direction), we suggest packing some lunch to rest at the picnic area. If you’re feeling adventurous, add two kilometres and take a dip in Warringa Pool. The walk is relatively easy, but be warned, it’s a steep return. Once you’ve tackled the decline, enjoy the essentials of a pre-packed picnic and cool off in the stunning heart-shaped swimming hole (if and when it’s open to the public, that is). Oh, and of course, get plenty of photos worthy of an Insty post. 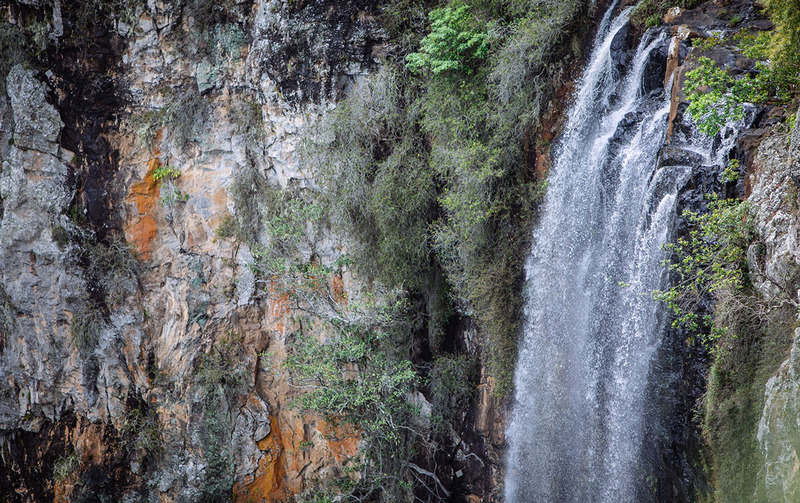 Starting at a cliff base before descending into a rainforest, on Warrie Circuit you’ll be exposed to stunning canopies, flowing streams, creeks and gullies. Take your time to appreciate the beauty of the canyon and its cliff of cascading waterfalls. Take adequate supplies (AKA food) as you’re in for a solid day of walking. If you’re not feeling a mission drive to reach the hinterland, this is your perfect option. Located roughly 30 minutes drive into the Currumbin Valley, the treetops will have your neck sore from constant craning. Perfect for an easy family walk or romantic stroll, you clamber down to the rock pools and cool off in the fresh water streams. This walk will see your day jam-packed with beauty and countless waterfalls and cascades. With a day lost (metaphorically speaking) in the wilderness, make sure you’re sorted with food, adequate hiking shoes and lots of water. You don’t want to be underprepared for this one. Rained recently? Beware of leeches, eep! A calming contrast to the craziness of Burleigh and the GC highway, this option will smack you in the face with its beauty. If you’re lucky, you can perch up and watch whales breach, leaving you feeling worlds away. Good for either a leisurely Saturday morning stroll or a blood-pumping trot. Take the less crowded route and get lost in the spiral of the headland. With a round circuit, it’s a quick little getaway for those with more time constraints. Of course, Straddie is affectionately known for its pumping surf and laid-back vibe. But, if you’re craving a little active movement then the Gorge Walk offers the perfect remedy. 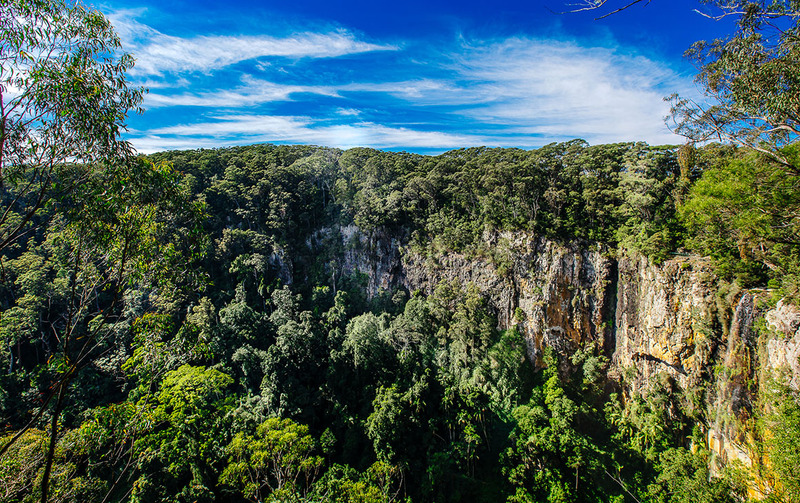 Stretching from oceanside cliff face to sprawling greenery, it’s the added touch of magic to your Straddie getaway. Essentially, you’re walking this track to take in the tranquil cascades of Cedar Creek. 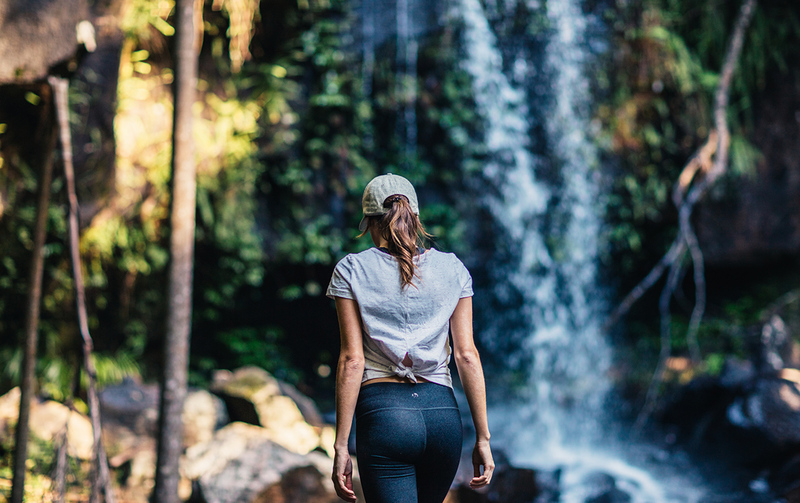 With an easy one-kilometre stroll to the creek, you’ll have worked up enough of a sweat to take a dip in the three waterfalls and fresh creek water. Unbeknownst to most of us, Mt Tamborine offers more than just awesome wineries. If you’re looking for a day on the mountain minus the booze, we suggest this easy, but not-too-easy trek. Descending into the valley and admiring nature at its finest has never been easier, especially when you know Witches Falls Winery is back at the top of the hill. Hello, motivation. If you’ve not visited the gushing beauty of Curtis Falls, you’re missing out. For a strong flowing waterfall, visit right after heavy rainfall with a rain jacket and brolly in tow. With the most stunning setting in lush rainforest, you’re bound to be feeling all the chilled out feels with this picturesque setting. It only makes sense for a World Heritage Listed park to offer an abundance of walking tracks. Binna Burra’s ample tracks range from a brisk walk to a full on hike. If you want a view worth the walk, take the Caves Circuit for stunning views into the Coomera Valley. The Green Mountain Section of Lamington National Park is for everybody, with trekking options to suit beginners or pros. If you really want to challenge yourself, take the Mount Merino track for a full-day experience. You’ll be too distracted by stunning canopies so you won’t pay much attention to your burning legs (hopefully). 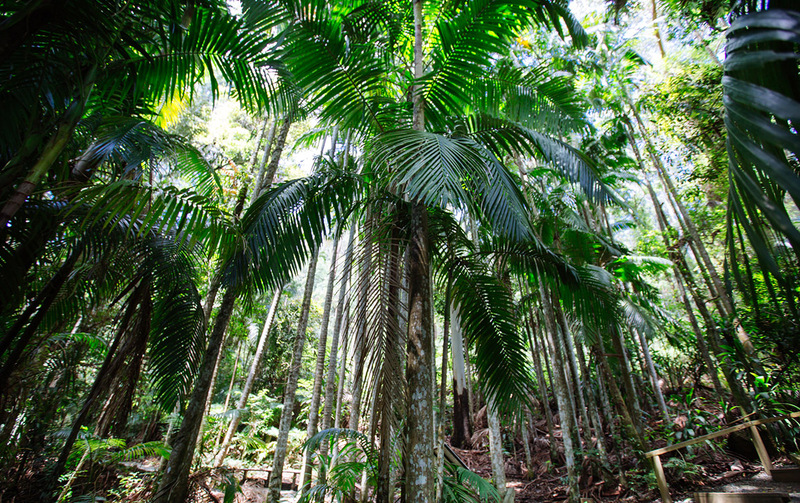 Looking for more of the best bush walks on the Gold Coast? You can’t beat this handy little guide. Kaitlyn’s best known, and proudly so, for her love of a good chow down. If ever she’s not eating, she’s usually found nose-deep in a novel or spontaneously travelling overseas on trips she can’t actually afford. She’s an avid believer in saying yes to everything (unless it involves jumping out of a plane or skipping meals). She talks a lot, smiles more and thrives off sarcasm and quick wit.